A volume label is not a must attribute in Windows, but it is often very useful to set a label for each partition on your computer. With a volume label, you can easily realize the function of every partition. For example, you may label C drive as "system partition" so that you know that the Windows system is installed on this partition. 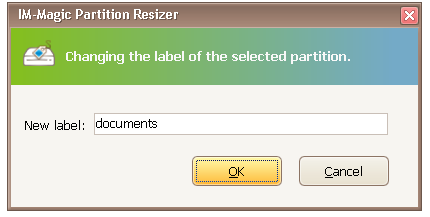 You can label a partition as "documents" if all documents are stored on this partition. In a word, a volume label is known as the volume name of a partition, which makes you easily know what it contains. Step1. Right click the partition whose label you want to change and select "Change Label". 1. Open "My Computer" in Windows and right click the partition whose label you want to change and then select "Format" option. 2. Enter a new label in "Volume Label" box and click "Start" button. 3. The volume label will be changed successfully when the formatting is completed. Tip: Formatting will erase all data on the partition, so backup the partition in advance if it contains important data.